« Our New Tea-Shirt Design Is In!!! Regarding the General Welfare clause, you reference “the Supreme Court interpretation of both clauses” and specifically the Jacobsen v. Massachusetts ruling as evidence in support of your view. However, you seem to be ignoring the Supreme Court’s ruling in National Federation of Independent Business v. Sebelius regarding the ACA. Additionally, ensure that your stance “Congress cannot grant things to individuals or preferred groups at the expense of another individual or preferred group” is uniform. Would it include grandma’s Social Security and Medicare benefits? How about Medicaid for those who have lost employment and SNAP transfer payments providing children of low-income families the ability to eat? To name a few. The article you are commenting on relates to the original intent of the Framers regarding the meaning of the term “General Welfare” – their words are copious and clear. Neither the court case you referred to, nor your second paragraph, squarely refute the Framer’s meaning. Moreover, defining late 18th century prose through a 21st century framework is historically imprecise. I’m not attempting a refutation of the Framer’s meaning. Rather, trying to clarify your interpretation of the framer’s meaning. I agree that “defining late 18th century prose through a 21st century framework is historically imprecise” which begs the question is a 20th century framework any different (as you cited a 1905 court ruling)? Regarding the court case I referenced, I was pointing out the inconsistency in your argument of citing a Supreme Court ruling as support of the Court’s interpretation of the general welfare clause with your own interpretation/belief. However, the recent Supreme Court ruling doesn’t support the view you espouse of the Court’s interpretation of general welfare clause and/or constitutionality of ACA. Re my 2nd paragraph: I’m asking wether or not, in your view of the general welfare clause, the same applies to these issue government programs. As far as your comment that the framer’s “words are copious and clear” – keep in mind that there is a difference in the framer’s words and the words of the constitution. The latter, not so copious and not so clear to many. The Supreme Court ruling in 1905 in Jacobsen v. Massachusetts was given in agreement with the original intent of the Framers in mind, as the article above clearly sets forth; the court did not impose a 20th century definition upon the 18th century terminology in the Constitution, as National Federation of Independent Business v. Sebelius clearly did with its 21st century myopia in-tow. Finally, the Framer’s words – as found in the Federalist, in their correspondence between one another, in their various public writings and speeches, etc. etc. – explain their words in the Constitution and they are both copious and clear. The key for us is, will we force their words to mean what we wish or will we hear them from their purview? Okay, thanks for your view on these issues. I see the path where discussions like these will follow around here. Well, the Founders did warn us that the Judicial branch would be infiltrated, at times, by activist judges who would reject the strict constructionist (a.k.a. originalist) view of the Founders and would thus legislate from the bench. These are those who would completely disregard the Founder’s original intent and impose their own. Also (as stated originally), make sure your views/comments are consistent. If we are to unequivocally and unabashedly “hear them from their purview”, wouldn’t the 3/5 compromise still be in place? I’m hoping you don’t view the 13th amendment as a case of 19th “century myopia in-tow”. 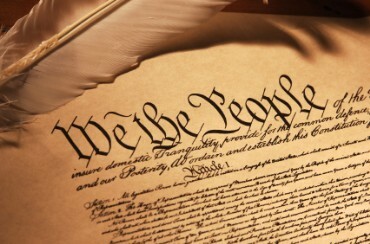 Again, the three-fifths clause must be seen from the Framer’s point of view – See http://www.heritage.org/constitution/#!/articles/1/essays/6/three-fifths-clause and http://www.wallbuilders.com/libissuesarticles.asp?id=122. The broader narrative and context surrounding this clause is worthy of deeper consideration than post-modernism has given thus far.